Since the nose is the central feature of the face, it can affect the entire facial harmony. When someone has a crooked nose, overly large nostrils, or a nose that is big, it can make them insecure about their full facial profile. Rhinoplasty is a procedure designed to alter and improve the shape and size of the nose. This was one of the first plastic surgery procedures developed and has become one of the most popular cosmetic options requested today. Undergoing rhinoplasty can have many positive effects. Here are just a few of the benefits of this facial enhancement procedure. 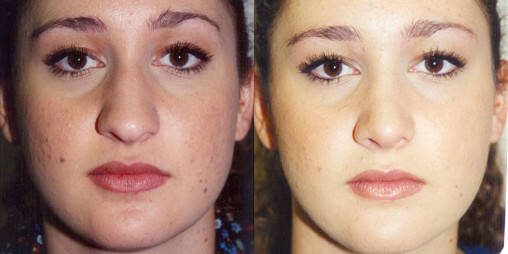 Rhinoplasty can help a person achieve a natural and fresh look even with the smallest changes to the nose. By refining the features of the nose, a patient can acquire overall facial rejuvenation. Many patients find that rhinoplasty helps remove a few years of aging from their facial appearance due to the refining effects associated with nose reshaping. Many people undergo rhinoplasty because the look of their nose has affected their confidence. They may find themselves embarrassed to take pictures because the shape or size of their nose makes them feel unattractive. Having the nose altered can help a person feel satisfied with their nasal appearance, and many patients experience a boost in confidence and are no longer afraid to show off their newly improved facial profile. People may undergo rhinoplasty for other than cosmetic reasons. When the nasal septum that separates the right and left nasal passages is crooked or deviated, it could block the passages and create an obstruction in breathing. During rhinoplasty, septoplasty can also be performed to straighten the septum and clear the nostrils for easier breathing. When someone has a deviated septum and is not breathing correctly, he or she tends to snore. The average snorer may have a dangerous condition known as sleep apnea that causes them to stop breathing periodically throughout the night. Occasional breathing delays can result in sleep interruptions, making a person feel tired and lethargic on a daily basis. Many patients feel that they sleep better and have more energy throughout the day after they have had a deviated septum corrected. Dr. Wald will evaluate your facial features and facial enhancement goals to determine the best options for your specific needs. Rhinoplasty is performed under a general anesthetic or IV sedation as an outpatient procedure. Depending on the type of correction needed, the procedure can take one to three hours to complete. Medications are administered to provide comfort throughout the procedure. Incisions are made inside the nose during closed rhinoplasty, or one incision is made across the tissue between the nostrils (columella) during open rhinoplasty. If flared nostrils need to be corrected, an incision is made at the junction between the nostrils and skin of the upper lip. The skin is separated from the underlying skeleton of bone and cartilage, and the nose is sculpted into the desired shape. The septum can be straightened if necessary. Once the nasal structures are shaped and sculpted as desired, the nasal skin and tissue are redraped, and incisions are closed. You've just had Rhinoplasty! Now what? A lightweight splint is placed over the nose to protect its new shape. Nasal packing may be placed inside the nose to provide additional support. Most patients experience some discomfort. Any pain can be controlled with oral medication. The face will be puffy, and the area around the eyes and nose will be bruised and swollen. It is important for the patient to keep his or her head elevated and still for the first few days. Surgical packing will be removed in four to seven days. The splint can be removed after 10 days. Many patients say the nose feels stiff throughout the recovery process. The area around the eyes and nose will continue to bruise and swell, but this should start to fade over the next few days. Patients should avoid any strenuous activity and should not touch or blow the nose. There will be some swelling, but any discoloration should disappear by this time. Most patients can return to work; however, strenuous activities must be avoided as the nose is still healing. Most bruising and swelling should have resolved. Although there will be a significant difference in the frame and structure of the nose, rhinoplasty results may not become fully apparent until sixth months to one year. Patients should protect the nose from direct sunlight by wearing a hat and applying sunscreen daily. You've just had a Rhinoplasty! Now what? We're eager to inform you of all of your rhinoplasty options and to answer any questions you may have. Schedule your consultation today and start your journey toward achieving the nose and confidence you desire!